Singer auditions for Broadway musical “Wicked” – The show will be hosting open auditions for a female triple threat to possibly join the show. 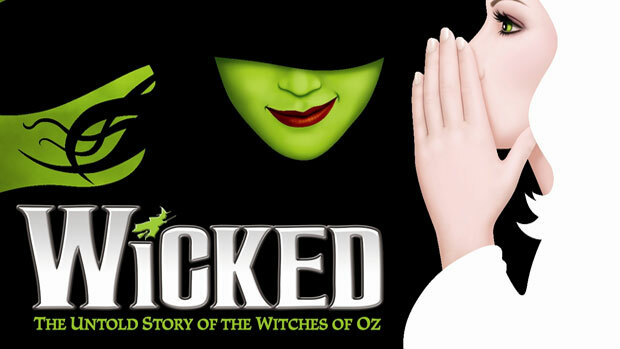 “Wicked” is looking for a 20 something female, of any ethnicity, who can sing, dance and act. 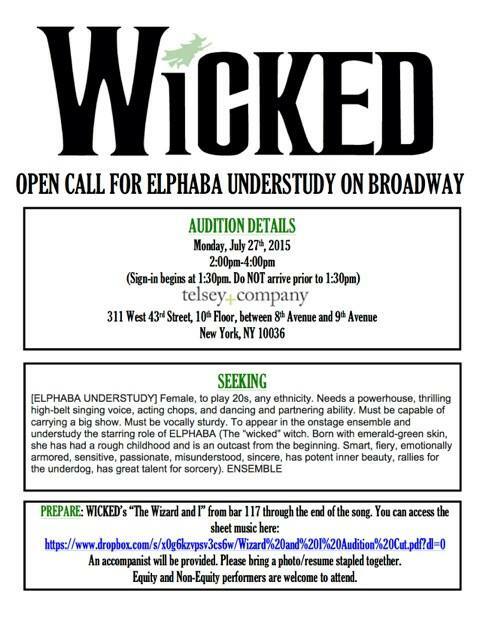 The Broadway show is holding auditions to find an understudy for Elphaba. Elphaba is the main characters in Wicked and is also known as “The Wicked Witch of the West”. Born with green skin, she was outcast from an early age. Elphaba is smart, funny and often misunderstood. Auditions for “Wicked” will be held on the 27th. Talent interested may see the below casting flyer for further information about the character and the auditions. Singers auditioning will need to sing “The Wizard and I” from the musical “Wicked” during the auditions. Both union and non-union singers are welcome to come and try out. 15 divas have played Elphaba since the show began. If you want to see the singers who had landed this role, timeout has an article discussing the all. “Wicked” is a re-telling of the L. Frank Baum’s classic story “The Wonderful Wizard of Oz,“….. from the witches perspective. “Wicked” is based on the Gregory Maguire novel “Wicked: The Life and Times of the Wicked Witch of the West“. The story begins before Dorothy ever set foot in OZ, but continues after her arrival. ”Wicked” is a tale of friendship and trust that reveals that there are always two sides to a story. The show’s main characters are Elphaba, the Wicked Witch of the West and Glinda the Good Witch. The show follows Elphaba through her childhood and schooling. Elphaba is a passionate activist who wants to fight injustice. Glinda is her “spoiled rich girl” friend. The two are unlikely friends who must deal with differences in opinion and get caught up in a rivalry over a man they both want. The stories events and their friendship will ultimately lead to Elphaba’s ultimate fall from grace and get Elphaba labeled “Wicked“. Interested? See all the details below.